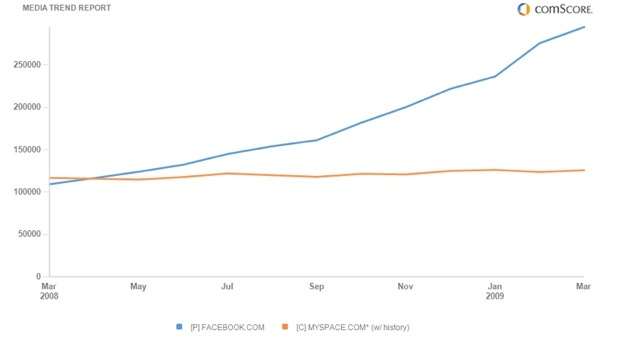 The popularity increase of MySpace has basically halted, with no more (or less) new users than this time last year, with no obvious fluctuations during the year either. Facebook on the other hand has seen 2.5x increase in new users since March 08, which is testament to the sites creativity, diversity and overall ease of use compared to MySpace (which many really don’t like anymore). April 26, 2009 in Internet, Web. This is interesting – I certainly thought that the myspace following would be decreasing (as opposed to remaining constant). I deleted my myspace after finding it completely inadequate now that everyone is on facebook and functionality is 10 fold better than myspace.